I included this image, titled “The Jelly-House Maccaroni,” in one of my postings on bundling over the past month. Published in London in 1772, it was actually three thousand miles and nearly a full generation distant from the Rhode Island newspaper essay I used it to illustrate, but it had the right libertine air. Joe Bauman asked me about the slang in the title. 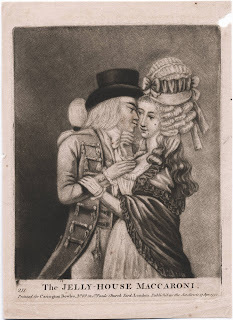 A “jelly-house” was a type of London restaurant that gained a reputation in the eighteenth-century as being an place where young rakes met prostitutes. ...Slip’s confusion very nearly discovers him; But hearing only the former marriage is mentioned, he gains courage, and with great effrontery treats this tale as a stratagem of Bellford and Jenny, who, he says, notwithstanding her master took her for an innocent girl out of the country, was a Covent-garden-bred wench, who had lived at a jelly-house, and had two children. . . . Nothing now remained but to get the money from Stockwell, who, having met with Jenny, treats all her former story as a fiction, and upbraids her with the jelly-house. This being an aspersion which she knew was groundless, she resolved to go to Bellford, and consult with him what was to be done. . . .
…a true picture of modern high and low life; from the splendid mansions in St. James’s to the subterraneous habitations of St. Giles’s, wherein are displayed the various scenes of Covent-Garden, and its environs, the theatres, Jelly-houses, Gaming-houses, Night-houses, Cottages, Masquerades, Mock-Masquerades, Public-gardens, and other places of entertainments. When the rustic American Yankee Doodle puts a feather in his cap and calls it macaroni, either the song is mocking him for thinking that’s fancy and fashionable, or he’s mocking the sort of English fops who chased after “macaroni” fashion. You can take your pick. I may not be able to forget the macaroni penguin since I'm not sure I ever learned about it before.